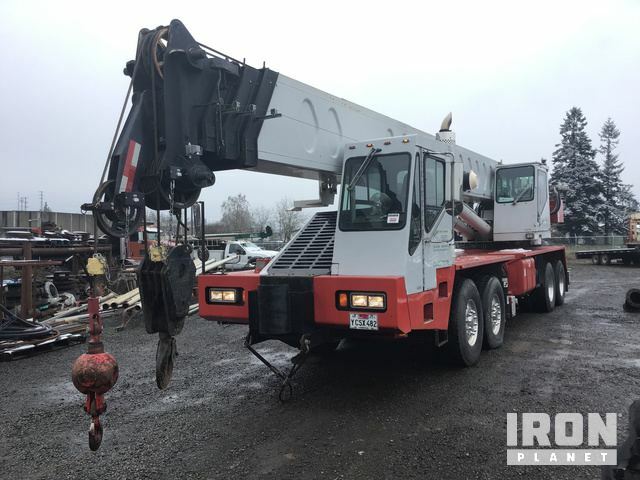 200 Ton Capacity, 200' Of Boom, 40' Jib, Auxiliary Hoist, McKissick 80 Ton 3 Sheave Block, Ball Hook, Counter Weight, Enclosed Cab, PAT DS 350 LMI, Hydraulic Outriggers, Air Conditioner, Heater, Detroit Series 60 Engine Lower Engine, Isuzu 6SD1TPB-03 Diesel Upper Engine, Eaton Fuller 8LL Manual Transmission, 8x4x4 Carrier, 385/95R24 Tires. Oil Pressure 75 PSI; Gauge inoperable Click here to open photos and videos of this item. Hour Meter/Odometer (Start) 9,412.0 Miles Click here to open photos and videos of this item. Hour Meter/Odometer - IronPlanet makes no guarantees as to actual hours/miles; we can only report what can be visually observed. Click here to open photos and videos of this item. Air Compressor Click here to open photos and videos of this item. Cross Members Click here to open photos and videos of this item. Tire Size 385/95R24 Front tires; 385/95R24 Rear tires; LF MICHELIN ; LR Michelin ; RR Michelin ; RF Michelin Click here to open photos and videos of this item. Tread Depth LF 24 /32"; LR 25 /32"; LMI 32 /32"; LMO 32 /32"; LRI 31 /32"; LRO 32 /32"; RRI 32 /32"; RRO 31 /32"; RMI 33 /32"; RMO 32 /32"; RR 33 /32"; RF 32 /32" Click here to open photos and videos of this item. Auxiliary Hoist Click here to open photos and videos of this item. Limited Function Check The hydraulic system was operational. 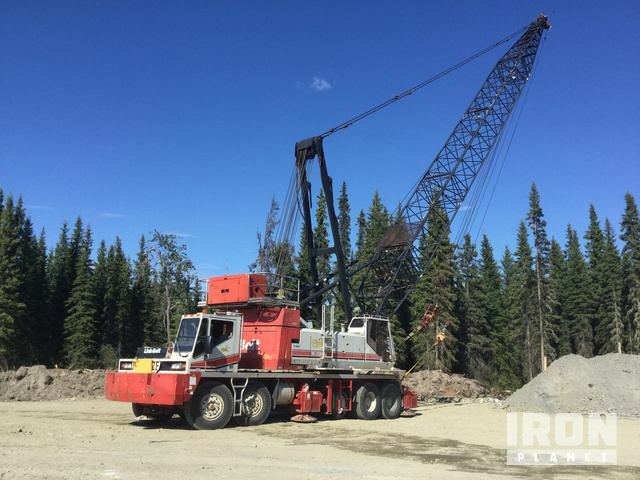 ; The hydraulic system was not operationally checked. Load Moment Indicator Not operationally checked with a load. ; PAT DS350; DS350 Click here to open photos and videos of this item. Controls Hydraulic or Air Click here to open photos and videos of this item. Load Charts Chart book in cab Click here to open photos and videos of this item. Drum Rotation Indicator Click here to open photos and videos of this item. Hour Meter/Odometer (Start) 428.4 Hours Click here to open photos and videos of this item. Hour Meter/Odometer Didn’t run engine long water leak - IronPlanet makes no guarantees as to actual hours/miles; we can only report what can be visually observed. Blow by @ idle (subjective observation) No noticeable vapor or pressure; Used the blow by tube Click here to open photos and videos of this item. Hoist Drums Click here to open photos and videos of this item. Boom Drums Click here to open photos and videos of this item. Pendant Line (Boom Tension Line) Click here to open photos and videos of this item. Point Sheaves Click here to open photos and videos of this item. Boom Point Section Click here to open photos and videos of this item. Gantry/Mast Click here to open photos and videos of this item. Boom Stops Click here to open photos and videos of this item. Main Boom Chords Click here to open photos and videos of this item. 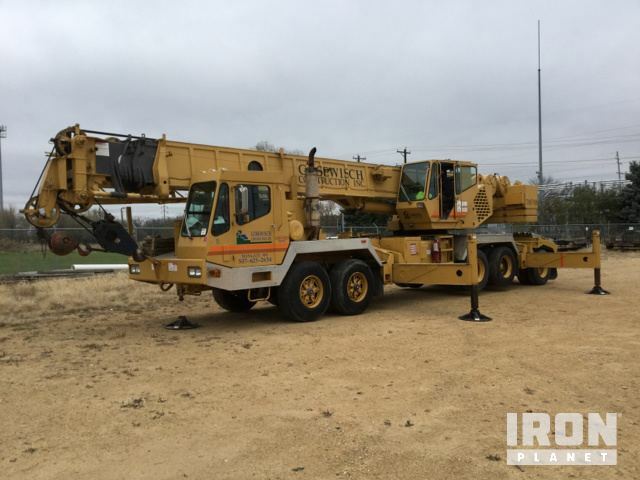 Boom Length 200’ ft. overall length; 40’ ft. base section; 5 Sections; 40' Length Click here to open photos and videos of this item. 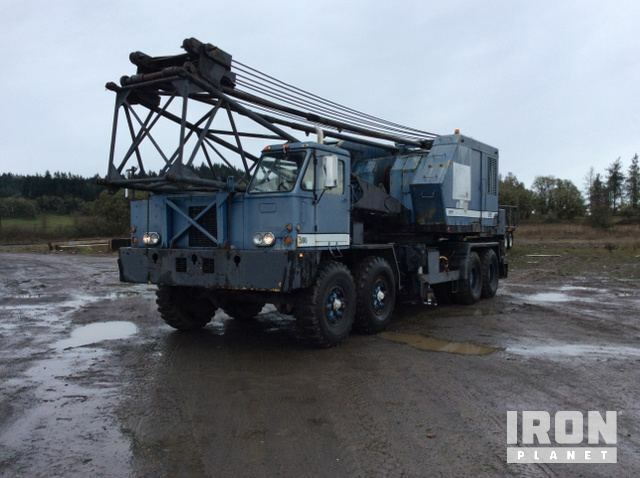 JIB Length 40’ ft. overall length Click here to open photos and videos of this item. Limited Function Check The main chassis components could not be operated. ; The unit could not be started and run; several components could not be checked. Main Load Block McKissick brand load block; 80ton capacity load block Click here to open photos and videos of this item. Overhaul Ball Click here to open photos and videos of this item. Fairlead Click here to open photos and videos of this item. Counterweights 5 counterweights; 2@13500 2@2300 1@21100 weights Click here to open photos and videos of this item.